Hey there bearded brethren. Let’s talk a little bit about what make a good beard comb. To be completely honest, anything with some teeth or pins sticking out of it that you can run though that beautiful beard can be considered a comb. So why bother buying anything other than that $2 plastic one we’re all so familiar with. Beard love that’s why. If you’ve put in the time and dedication to grow that beard to it’s full glory your gonna want to give it the love it deserves. Let’s talk about the plastic combs first. There’s some great plastic combs and some not so great plastic combs. When it comes to plastics it’s not as important as to what type it is as much as how it’s been formed into it’s final shape. That’s if were not talking into account the impact on the environment. There’s a lot of manufacturing methods for forming plastics but injection molding is king when it comes to production numbers and cost. The plastic material is as cheap as dirt so once your up and running you can produce small items for pennies. Then there’s the process of cutting from sheets of plastic either by punching them out with dies or using cutting equipment like cnc routers then finishing them up by hand. What’s all this mean. Basically it means you get what you pay for. A comb built with only cost in mind will probably be a rough experience on everything but your wallet. Spend a little more and you’ll get a little more. Companies that dedicate time to hand finishing their combs show they care about their product and truly want to produce a better comb and grooming experience for their customers. Now what about wood combs? There’s definite advantages and disadvantages to producing a comb in wood. The challenge for the designer of the wooden comb is to come up with a design that’s functional and beautiful while working within the limitations of the chosen wood species. This is a challenge that can be overcome by laminating the combs from multiple layers of hard wood. By alternating the grain direction, much like a skateboard deck, we can construct combs that are the size we want without the fear of them breaking too easily. Of course here at Big Red we’re a little bias towards wood over plastic for beards combs. Besides the beautiful grain and warmth of wood, they don’t build up static and are just plain beautiful to look at. We’ve decided to design a comb that is thin, light, small, and durable. Something you could use at home or throw into a travel bag and take with you. We’ve achieved that with the No.3 & No.7 beard combs but we were still left wanting a pocket comb we could take everywhere. We’ve decided to utilize that often forgotten pocket. You know, that little 5th pocket on your jeans that seems to be empty 99% of the time. The No.5 was our answer to the everyday pocket beard comb. I hope in my ramblings I could offer some insight to help my bearded brethren make a wise choice the next time you find yourself staring at the plethora of comb options. 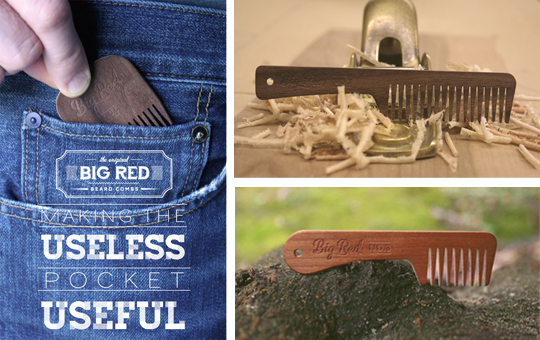 Of course, if wood is the choice, then Big Red Beard Combs is here to help.